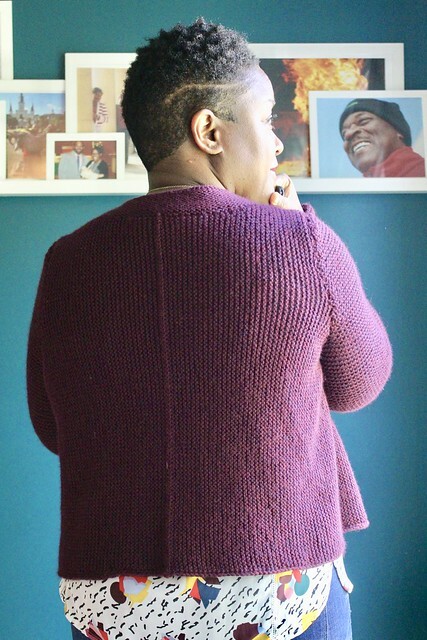 It’s finally time to share the last test knit I did in September! Meet Rumo, a really great knit. I tend to volunteer to test knit for designers I really love and Alice Caetano’s designs are just so smart and her construction is always so clever. I don’t design knits because honestly I think there are amazing designers out there and my mind doesn’t work that way. But I can pick color! This sweater is knit sideways (I love sideways construction, I don’t know why) and it has such a great shape. 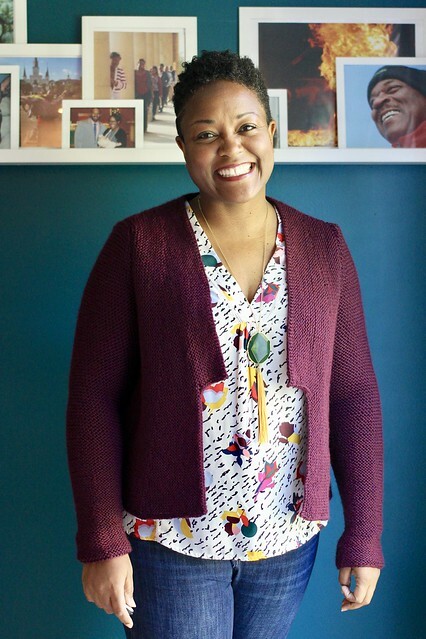 It’s not your typical cardigan, it has a bit of interest to it with the seam details on the back, sides and sleeves and the squishy garter stitch sleeves are perfect on chilly days. The only seaming is with the sleeves and that I didn’t mind at all. I decided to knit this one in a solid so that it could be a closet staple. I love this shade of Berroco Vintage yarn in Black Current. It’s a really rich and bold color that pairs perfectly with a lot of what’s in my closet (I love this color with orange). I bought it a couple of years ago for a sweater for my husband and then he changed his mind on the color. I’m glad to get that sweater quantity out of my stash! I found one of the new knit collection Swatch watches that matches is beautifully. Clearly I’m knitting obsessed. Excelent job! Very elegant cardigan! It looks so nice on you, Dana! Wonderful job….as always! Beautiful work and color!!! Love your watch, too!!! That watch is really fabulous. I’m so glad you linked to it because I was going to ask where you got it. I want one! 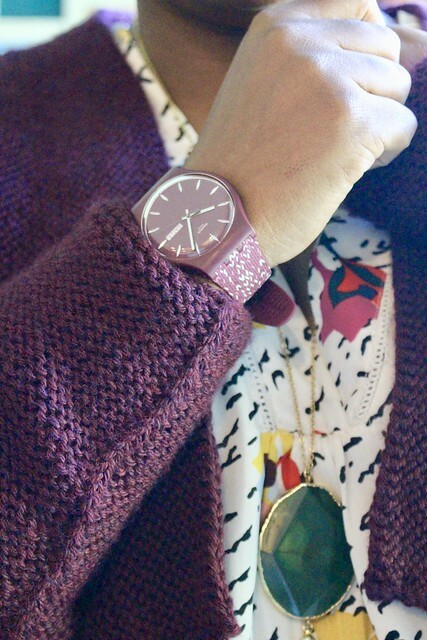 Love the color, the sweater, the watch and you! You look terrific. Well done! 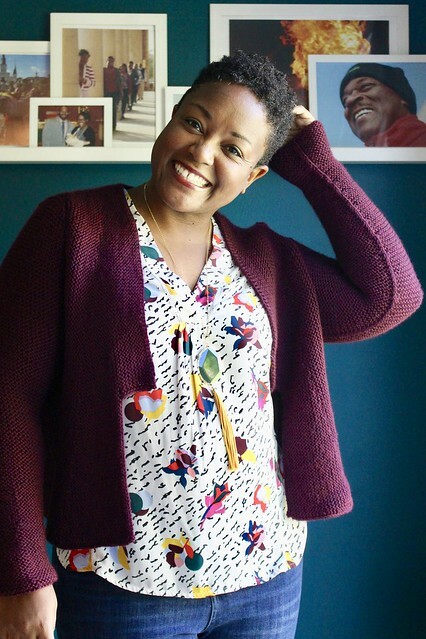 Love everything about this cardigan – the design, your color choice, and best of all – the matching watch! The sweater is gorgeous – just like your smile! Pretty Sweater, and looks great on you! Boy, I give it to you in the fast knitting. I didn’t know Swatch watches were still being manufactured. When they first came out in the 70’s I started buying them. People who knew I liked the watches, would give them as presents. I stopped when I was spending over $100/year for batteries. The one you have is cute. They’ll give you batteries for free now!!! Found my way here via Ravelry. I love your version. Unrelated question but: that’s a fantastic shirt beneath your wonderful Rumo. Would you be willing to say the brand? Bought it from Nordstrom’s years ago.